Did we mention it costs a lot? The X4 finally gets its performance edition in the form of the X4 M40i, which arrived in showrooms this year. The 2016 BMW X4 grasps for attention, while it drops the cargo-carrying, off-roading SUV pretense. Coupe-like crossovers may sound foreign, but BMW's making a native business out of catering to every configuration in the carmaking universe. 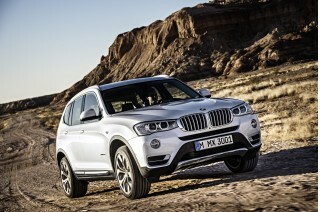 BMW's been a chief proponent of stylized utility vehicles, and for 2015 it introduced its latest effort, the X4. 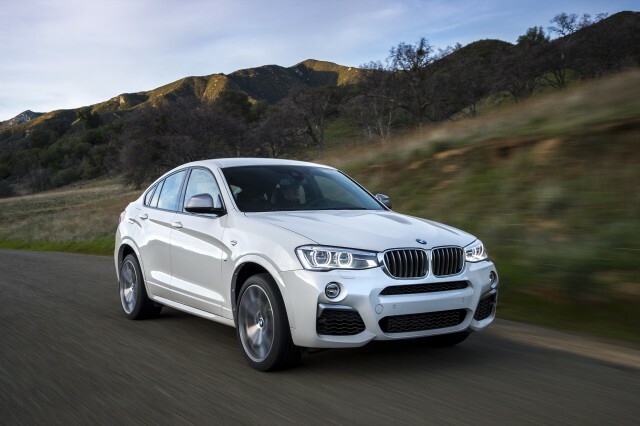 The 2016 BMW X4 doubles down on the recipe BMW tested with the bigger X6. The X4 simply takes an existing SUV—in this case, the X3—and tapers its roofline for a more intriguing look and less interior space. 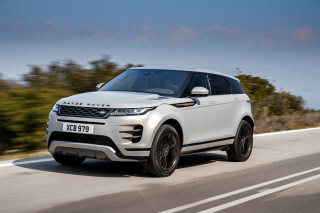 In doing so, it takes the more upright SUV shape and fashions a more direct rival for vehicles such as the Range Rover Evoque, Porsche Macan, even the Lincoln MKC. Like its bigger sibling, the BMW X6, the X4 purposely gives up some of its functionality in the name of fashion. BMW planes down the rear end of the X3 to give the X4 a more curvaceous and gracious profile—and on first glance, the X4 does a better job of tailoring its duds than does the bigger X6. As you spend more time with the X4, the design's flaws become more noticeable, especially its thick rear haunches. Other details seem to work even better, like the break in the shoulder line, and the break of the C-pillar, which BMW means to hint at the X4's performance capabilities. 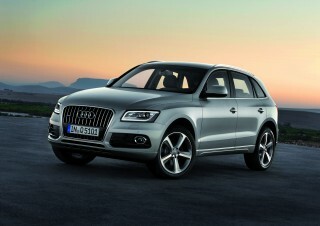 The X4 offers the same aluminum and wood trim found on the X3, or a choice between xLine and Sport packages as options. The M Sport line adds special paint, M badges all around, sport seats, and bigger wheels and tires. The xLine trim is the same idea, just with a glossier look. 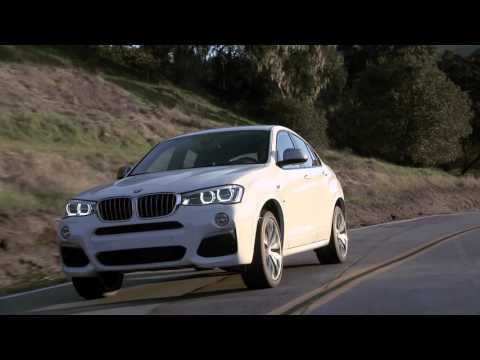 Like the X3, the X4 offers a choice among four-cylinder and two six-cylinder options. 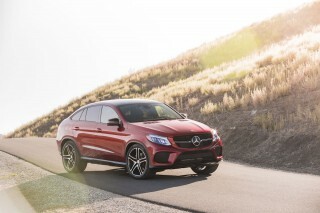 The base powertrain combines a sweet-spinning turbocharged 2.0-liter inline-4 rated at 240 horsepower with an equally talented 8-speed automatic in the X4 xDrive28 model. 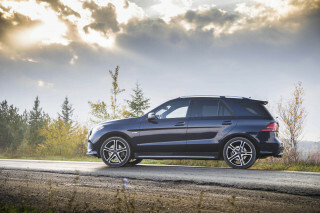 The turbocharged 3.0-liter inline-6 X4 is good for 300 hp and 300 pound-feet of torque in the X4 xDrive35i. With a Driving Dynamics Control system, you can select between several "attitudes"—including Eco Pro—to best fit your priorities. BMW estimates 0-60 mph times with the X4 xDrive28i owners at 6.0 seconds, the X4 xDrive35i, in just 5.2 seconds. 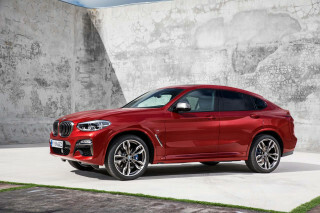 The pinnacle—for now—is theÂ uprated and upgraded BMW X4 M40i. It presses the turbocharged six for another 55 hp, bringing the total to 355 hp, and bumps torque to 343 lb-ft. With a standard 8-speed automatic and all-wheel drive, the new model's good for a 0-60 mph run in 4.7 seconds, and a governed top speed of 150 mph. 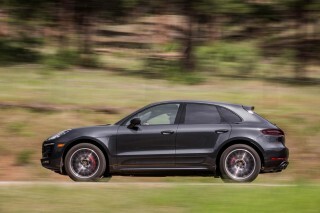 There's a unique calibration for the all-wheel-drive system and the automatic; a distinct sport suspension tune; more responsive steering; 20-inch wheels and tires; and a sport-tuned exhaust system with a resonator that pumps some engine noise into the cabin. The cockpit also gets a leather steering wheel, gear shift lever, sports seats, door sills, and instrument cluster. 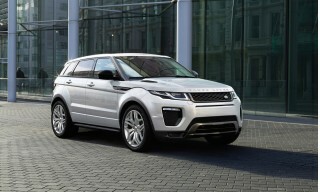 The X4 comes equipped as standard with all-wheel drive, that splits power 40/60, front to rear. The system can shift all the power to the rear wheels if needed, which makes it more of a performance all-wheel-drive setup, as opposed to an all-weather outfit. BMW cribbed the X3's suspension setup into the X4, which is mostly comfortable. The standard run-flat tires spoil the ride somewhat, but the X4 is mildly oversprung to compensate—pick your poison. Performance Control is standard for the X4 this year and can use the stability control systems to damp an inside wheel to better carve corners. 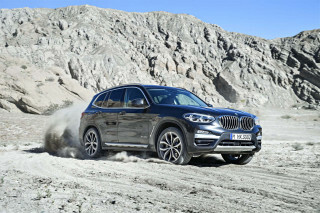 Most of our driving time in the X4 has come behind the wheel of the higher-powered xDrive35i model. From days of putting it through a laundry list of errands and undisclosed favorite roads, we found few differences between it and the more upright X3. The X4 is about a half-inch longer than the X3, and sits 1.5 inches lower, but the lower center of gravity doesn't alter its essence—just gives it an incrementally sharper feel. The X4 is, like the X3, athletic and agile for its size, and doesn't have much discernible nose dive or excessive body motion in deep corners. Unsurprisingly, the X4 feels best in Sport mode—it's a BMW, after all—with more heft in the steering and a firmer ride. The X4 gets variable ratio sport steering as standard, with a more relaxed on-center feel, but nimble directional attitude at higher speeds. We even think the rack has more road feel than X3s equipped with the Servotronic systems we've driven in the past. We'd highly recommend fitting the adaptive dampers ($1,000), which can toggle the suspension through Normal, Sport, and Sport Plus settings. The Driving Dynamics Control system adjusts not only the dampers, but also the transmission shift points, steering feel, and throttle tip-in based on the selected mode. The X4's overall footprint isn't identical to the X3, but it's close. Like the X3, the X4 can carry three in the back—on paper. BMW has given the two outboard passengers preference with sculpted cushions, so riding hump is literally that. Up front, passenger and driver space are adequate, and the second row only suffers in head room, typically of many aggressively sloped rooflines. Speaking of that roofline: it cuts into cargo space. The overall area behind the back seat measures 17.7 cubic feet, or 49.4 cubic feet with the seats folded down—enough room for a sofa table. A power tailgate on all models opens to access the cargo area, some models can be optionally equipped with a system that will open the tailgate by waving a foot underneath the bumper. So far, neither major safety rating organization has tested an X4, and we don't expect that will change anytime soon—they just don't sell enough to justify throwing one into a wall. The X4 comes standard with plenty of airbags and can be fitted with optional safety extras such as adaptive cruise control, foward collision warning, a surround-view camera system, and lane-departure warning. A Parking Assistant can park the X4 in parallel spots, but its gimmick quickly grows stale. All X4 'utes get the usual standard features, including power locks, windows, and mirrors; cruise control; and keyless entry. The X4 also sports standard paddle shifters, sport steering, leatherette upholstery, power tailgate, automatic climate control, power adjustable front seats, rear parking sensors, a leather-wrapped steering wheel. BMW's iDrive controller and infotainment display are standard on the X4, but navigation costs more. When optionally fitted, the iDrive controller gets a touchpad surface that will accept destination entry via scratching each letter out with a fingertip. This year, BMW expanded the X4's Bluetooth and USB connectivity with support for more phones, voice control for music, and office functions such as calendar management available on the system. A premium Hardon Kardon system is standard on turbo-6 models. BMW bundles its apps as optional, which connects to smartphones and streams internet radio such as Pandora, Rhapsody, and Stitcher. 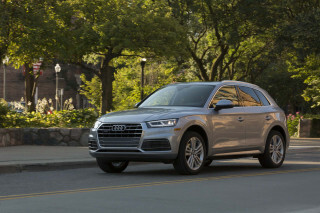 The big options bundles include the xLine group that adds 19-inch wheels and gloss trim ($1,500); a tech bundle with navigation, head-up display, and real-time traffic ($2,750); adaptive cruise control ($1,200); a surround-view camera system and blind spot monitors ($1,700); and a rearview camera ($700). We take umbrage with the latter, considering the car starts at more than $40,000. The 2016 BMW X4 costs $46,245 in base X4 xDrive28i trim or $50,695 for the X4 xDrive35i. The X4 is assembled in South Carolina, alongside the X3, X5, and X6. Gas mileage in the X4 isn't particularly great for how small it is inside. A stop-start system is standard, but sends shivers through the car on restart. According to the EPA, the X4 manages 20 mpg city, 28 highway, 23 combined for the turbo-4, 19/27/22 mpg for the turbo-6. Like many other BMWs, including the X3, the X4 includes an Eco Pro mode that reduces power consumption by the accessories and will let the car "coast" in certain circumstances to increase fuel economy.